An internal aviation safety management system (SMS) audit is a process you use to verify that certain actions are taking place in your SMS. Audits are a safety assurance activity that is most commonly used to broadly assess whether or not aviation service providers can demonstrate continuous improvement of the SMS. Internal aviation SMS audits are generally used to prepare for external audits by compliance authorities. They help you identify deficiencies in your SMS and correct them before auditors “ding” your safety program with a finding. 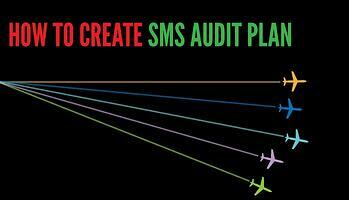 Creating an aviation SMS audit plan for each auditing process is absolutely crucial for performing good audits. The steps that will be used to conduct the audit. An auditing plan should be laid out in very clear terms. You should be able to show your auditing plan to a stranger and provide them with all of the information they need to understand the scope of each type of audit. The purpose of internal SMS audit plans is to create a road map for your audits. They are a way to control the way you conduct audits. If you are not happy with your auditing results, you can easily change the way you audit by changing your auditing plan. Furthermore, an auditing plan allows you to involve independent, third parties to perform your internal audits in a way that you can manage expectations. There are many private auditing companies that you should be wary of, especially the ones that lack objectivity and a sound "moral compass." Each auditing plan should have its own auditing form. This auditing form will outline the steps for completing the audit. Each question will involve a different action on the part of the auditor for assessing your SMS. Should necessitate actually doing some field work to get information, as to involve employees in the auditing process. Each question should also indicate whether there is a finding and include space for additional comments by your auditing team. There may be other “who” aspects of your company that you need to document depending on your operations. Your auditing form and this part of your auditing plan should be in perfect alignment: there should be no audit form questions that do not match up with “what” you will be auditing in your audit plan. The last piece of important information your audit plan should include is how often you will be conducting the audit. We recommend any given type of internal SMS audit be conducted at least once per year, or before an external audit if it comes sooner. The circumstances that initiate an audit.